Frank Comments: In this one, we know which character on the cover is referred to by the title, because he’s the one grabbing the active element on his weapon. The mannequins would never do such a thing. 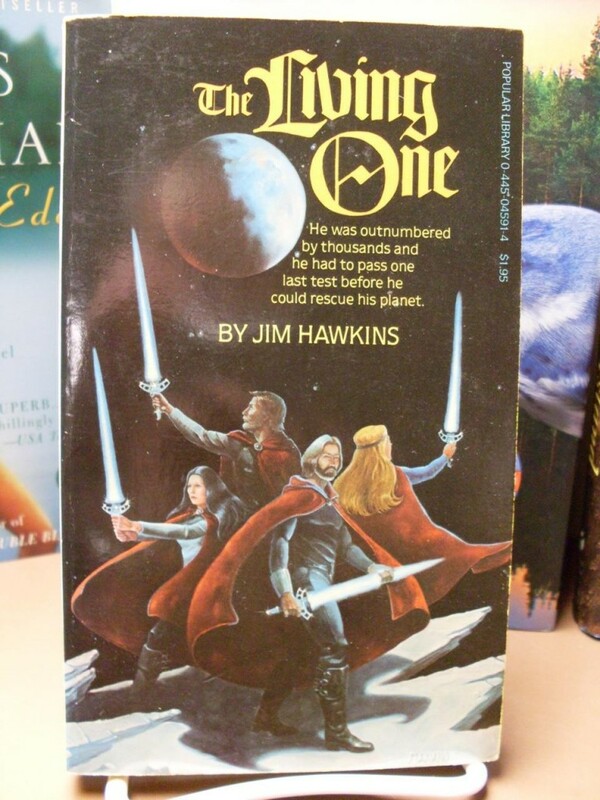 Tagged with: awesome foursome • beard-wielding • bladed weapons • capes • damsel • dude • glow • Jim Hawkings • Mariano • planets • Popular Library • space • sword • Ting! Isn’t that one of the BeeGees? Mind you don’t cut your fingers, now. And how come its windy enough for those heavy looking cloaks to be billowing while their manes of hair remain resolutely coiffed? I’m guessing that the robes stand out on their own like hoop skirts. Or they could be generating powerful winds of their own beneath their robes â€” but in a magically sublime, non-crass way of course. Is the test he has to pass how to breathe without any spacesuit while in outer space? His one last test … Stayin’ Alive ah ah ah. Far be it from me to take anything away from ABBA or the BeeGees, but might I suggest a young Kenny Rogers? Boy, this is reminding me of the old Dungeons and Dragons days. Those four are outfitted in off-the-rack D&D adventurer style circa. 1980. Only … for some reason those swords are making me think of elongated popsicles. I can’t work out how their movements and the air can make their capes do that. I think either Dead Stuff With Big Teeth is right — they’re twirling — or Yoss is right and they’ve got hoop skirt foundations holding them out. That awkward moment when you realize that everyone else at the costume party ALSO decided to go with a red-cape/glowing-sword combo. Being “The Living One” isn’t much of a distinction, you know. What’s with the Yuletide fonts?? Are these guys on a mission to save Santa Clause in space?? “Håh håh håh håh! Ai kän krush the blade öf my swørd with my bäre händs!”, shouted Benny to his fellow bandmembers. The title of the book is The Living ONE. Which implies that three of these four people are actually dead. But which one is living?? ?